"No, I've been gray all my life." Age takes its toll on everyone, including your furry friends. 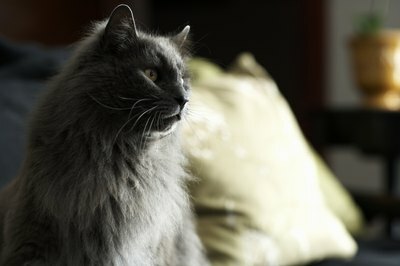 As your cat ages, his immune system isn't as strong as it once was and his organs don't function as well. Take him to the vet for regular checkups so age-related diseases receive prompt treatment. Hyperthyroidism is a classic old age feline malady, since the average age of diagnosis is 13. Because your cat's thyroid glands control much of his metabolism, once they begin producing too much thyroid hormone your cat can show various symptoms. Among the most common are weight loss even though he's always ravenous, increased drinking and peeing, restlessness and personality change, dull coat, vomiting, increased heart rate and depression. Fortunately there are several ways to treat and even cure the disorder. Your vet can prescribe daily medication, which controls the disease. Surgical removal of the thyroid glands can offer a cure, but your best bet is radioactive iodine treatment, which consists of an injection and temporary quarantine at a veterinary facility. If your kitty's kidneys start failing, there's no cure, but a change of diet and medication can give him extra time. According to the Cornell University College of Veterinary Medicine, kidney disease is most often diagnosed in cats age 7 and up. Unfortunately by the time your cat develops symptoms, the disease is usually somewhat advanced. Signs of kidney failure include increased drinking and flooding the litter box, along with appetite and weight loss. Your vet might prescribe a special diet for cats suffering from kidney disease, along with intravenous fluid therapy. Older cats not only suffer from physical diseases, but mental diseases as well. Feline cognitive dysfunction is the equivalent of cat Alzheimer's. It might also result from neurological disease. If your aged cat appears disoriented, starts wandering around the house meowing late at night, stops using the litter box or changes his eating and drinking habits, take him to the vet. Depending on his diagnosis, your vet can prescribe anti-depressants or anti-anxiety medication to help your old buddy. If you have an older dog suffering from arthritis, odds are he's limping. That's not so true of feline arthritis, so you might not realize your old cat is affected by this joint disease. Cats with arthritis might appear lame and creaky, but just as often they simply become less active. Suspect arthritis if your cat isn't sleeping in his usual favorite high places. He might not run around very much or might hesitate to climb stairs. His joints might seem swollen. While there's no cure for arthritis, your vet can prescribe medication to ease joint pain and make Puffy more comfortable. Other diseases common in older felines include diabetes mellitus, which occurs when his pancreas no longer produces sufficient insulin. Your vet will show you how to give your cat daily insulin shots. Many older cats experience dental disease. Your vet should examine your cat's teeth regularly, performing cleanings and extractions, if necessary. Older cats might also suffer from hypertension, or high blood pressure. The key to dealing with these and any other diseases is regular vet visits. Your vet can help your geriatric cat make the best of his golden years. What Age Do Beagle Puppies Start Howling?